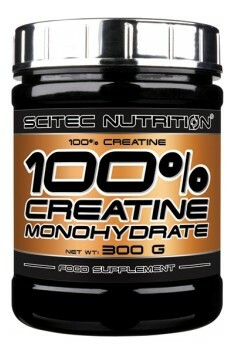 Scitec 100% Creatine Monohydrate is 100% pure creatine monohydrate of strong ergogenic properties promoting muscle mass building. Creatine is the most popular and well-tested supplement used by both amateurs and professional athletes. Creatine is an organic chemical compound naturally occurring in the body system. It may be synthesised from L-glycine and L-methionine, which it is build from. In the body system, creatine is converted to phosphocreatine (PCr), which plays an important role in the production of high-energy compounds. In muscles, the enzyme, creatine kinase, consumes PCr to restore the reserves of adenosine triphosphate (ATP) from adenosine diphosphate (ADP). This reaction is essential for the production of energy in the muscles, because ATP, as a high-energy compound, gives its energy to different biochemical reactions, including contraction of muscle fibers. Creatine monohydrate is a combination of creatine molecules with a water molecule, which increases hydration of muscle cells and contributes to the increase of their volume. Together with water, it supports transport of nutrients necessary for the proper regeneration and growth. During supplementation, you can quickly gain a few extra pounds due to the increased water content in cells. By promoting energy production at the cellular level, creatine helps to increase strength and endurance of muscle. This has been proven in the study in which the group taking creatine was subjected to regular strength workout. After 4 weeks, the group reported significantly higher levels of strength, aerobic and anaerobic capacity than the group performing only strength trainings without supplementation. Many times, it has been demonstrated that creatine increases the level of maximum strength and muscle endurance as well as can delay fatigue, thus enabling you to perform a longer or more intensive training. It is worth mentioning that the main storage place of creatine in the body are skeletal muscles, which contain 95% of the total content of creatine. Increased supply of water and nutrients is one of the main mechanism of creatine action, which contributes to the increase in muscle mass. However, the insulin-like growth factor (IGF-1) has a more significant impact on the hypertrophy, as it stimulates the synthesis of new muscle proteins. Some studies report also an increase in testosterone level in men, which facilitates muscle mass building and promotes the maintenance of athletic figure. Moreover, creatine increases resynthesis of muscle glycogen, which ensures not only a supply of the necessary fuel for muscles, but also their good look. It has been demonstrated that creatine reduces muscle damage caused by resistance training, which, if occur in excess, can hinder muscle mass building and even cause its disappearance. Creatine lowers the level of myostatin, a tissue hormone reducing proliferation and multiplication of satellite cells determining the effect of muscle hypertrophy. To sum it all up, Scitec 100% Creatine Monohydrate is pure creatine monohydrate which is safe and 100% effective, and at the same time its price is not too high. Its proven effects make it one of the most popular supplements. Creatine effectively increases strength and endurance of muscles, which is why it will be perfect for athletes engaged in strength, endurance and mixed disciplines. It is also ideal for increasing muscle mass, because it effectively inhibits catabolism of muscles and promotes anabolism. Bardzo dobre kreatyna ze względu na działanie oraz cenę ! Ładnie pompuje wodą, wzrost siły zauważalny już po 2 tygodniach stosowania, a więc znacząco szybko :) POLECAM w 100% SZCZERZE ! nie droga kreatyna a efekty bardzo dobre! jedna z lepszych jakie stosowałem. po skończeniu cyklu masa 4.5kg do przodu!jestem bardzo zadowolony z efektów i na pewno następnym razem kupie kreatynę od Sciteca! daję 5na5 i polecam. świetna kreatyna! już dawno nie czułem takiej siły i energii na treningu. działa na mnie rewelacyjnie! zauważalny przyrost siły i masy. produkt kompletny daję oczywiście 5 na 5 i polecam gorąco! Polecam - tania i dobra kreatyna. One portion (5g) 30 minutes before breakfast, the second portion (5g) after training. One portion (5g) 30 minutes before breakfast, the second portion (5g) after a few hours, before a meal. Unless the body mass of the user exceeds 100 kg, on non-workout days only one portion of creatine may be used, maintaining two portions on training days, according to the above recommendations. Using for at least 8 weeks should discover the full potential of the product. Dietary supplement increasing secretion of growth hormone. Accelerates regeneration and improves the quality of sleep. A complex of easily absorbed L-Glutamine. It supports muscle recovery and reduces catabolism. A complex of several forms of L-glutamine with excellent absorbability. It facilitates regeneration.